Minister for Economy, Trade and Industry, Japan, Yoichi Miyazawa called on Indian Prime Minister Narendra Modi, in New Delhi on April 29, 2015. New Delhi: The Japanese Minister of Economy, Trade and Industry Yoichi Miyazawa conveyed to Indian Prime Minister Narendra Modi, when he called on him yesterday, that he had come with a delegation of top business leaders, who have firm plans to invest USD 3.0 billion in India in the immediate future. The investment plans, The Japanese Minister said, was in pursuance of the shared commitment of Japanese Prime Minister Shinzo Abe and Prime Minister Narendra Modi to enhance Japanese investments in India, especially in support of Prime Minister’s “Make in India” mission. Miyazawa also proposed a new Joint Working Group between Ministry of External Affairs of India and METI of Japan on civil nuclear energy cooperation. Miyazawa expressed happiness with the working of the fast track mechanism for India-Japan Collaboration – Japan Plus and underlined his government’s support for further strengthening it. 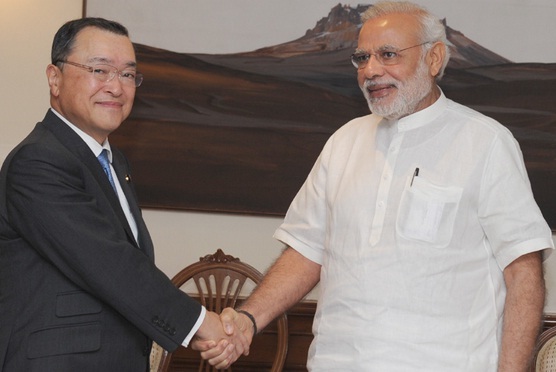 Miyazawa reiterated his Government’s strong commitment for providing and facilitating long term funding to support the development of India’s manufacturing and infrastructure, consistent with Abe’s commitment to Modi in Tokyo last September to facilitate financing and investments of up to 3.5 trillion Yen in the next five years. He reaffirmed Japan’s interest in supporting the development of High Speed Railways in India, citing Shinkansen’s excellent record in performance and safety over five decades. Miyazawa also discussed with the Prime Minister India-Japan collaboration in the energy sector and expressed admiration and aspiration for India’s rescue and relief mission in Nepal and added that it had earned India the respect of the world. The Indian Prime Minister thanked Miyazawa for bringing a strong business delegation to India and reiterated that relations with Japan was a top priority for his government. Japan was a partner of preference for India’s economic development, he said adding the Indian government would continue to take steps to further facilitate and accelerate Japanese investments in India. Modi also suggested that India and Japan should work out a special long term arrangement for financing infrastructure and industry in India, consistent with the strategic partnership and India’s enormous economic opportunities.